Kind of defeats the purpose, doesn't it? 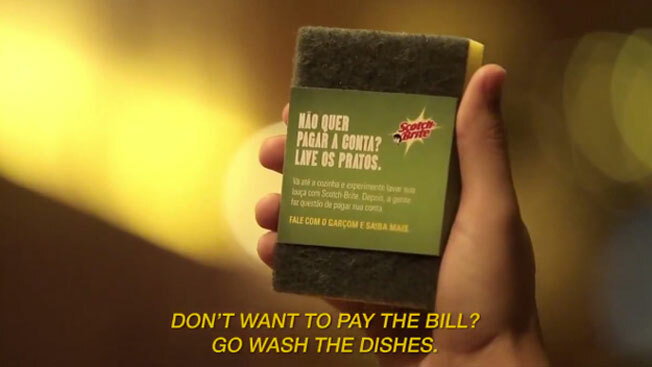 Many's the night I've lain awake wondering how to sell more sponges to hipsters in Brazil. Grey 141 addresses this concern for Scotch-Brite, introducing the brand to twenty-somethings at various São Paulo eateries by offering them the chance to do dishes in lieu of paying their bills. These suntanned well-to-do's look like they're never scrubbed a plate in their lives. They giggle, flash goofy grins and give thumbs-up signs as they brag about dodging the check. It's like a working-class flantasy to them. (Yes, I said flan-tasy—deal with it!) Isn't avoiding dishwashing the whole point of going to a restaurant? Personally, when I'd rather not pay, I prefer the rush of sneaking out through the men's-room window and making a mad dash across the parking lot. Bite me, Sizzler! Via Adverblog.